An artist's illustration of a PTScientists Audi Quattro rover exploring the moon near NASA's Apollo 17 lunar rover. The moon will get a 4G mobile phone network to connect the rover and its twin to a PTScientists lander. Call it one giant leap for 4G. The moon is about to get its very own mobile phone network. Vodafone Germany has teamed with Nokia to build the first 4G network on the moon. The network, which will be built in 2019, will support a private lunar rover mission by the Berlin-based team Part Time Scientists, known as PTScientists. The group was one of several teams that competed in the Google Lunar X Prize, a private race to the moon that will end in March with no winners. But although the Google Lunar X Prize competition is over, PTScientists' "Mission to the Moon" is not. The group aims to launch a lander and two small rovers to the moon from Cape Canaveral, Florida on a SpaceX Falcon 9 rocket during the 50th-anniversary year of NASA's Apollo 11 moon landing. The moon's 4G network, which Vodafone Germany announced Tuesday (Feb. 27), will support PTScientists' twin Audi Quattro rovers and their lander ALINA (short for Autonomous Landing and Navigation Module). 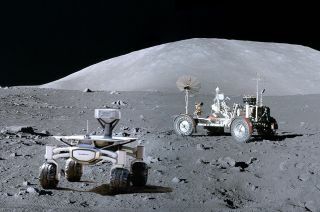 PTScientists will use its rovers to study the lunar rover used by the Apollo 17 astronauts during their historic December 1972 mission to the moon's Taurus-Littrow Valley. Vodafone picked Nokia to build a space-worthy version of its Ultra Compact Network, one that will be the lightest ever made, at just 2.2 lbs. (1 kilogram) — no heavier than a bag of sugar, Vodafone representatives said in a statement. "This project involves a radically innovative approach to the development of mobile network infrastructure," Vodafone Germany CEO Hannes Ametsreiter said in the same statement. "It is also a great example of an independent, multi-skilled team achieving an objective of immense significance through their courage, pioneering spirit and inventiveness." Under the plan, PTScientists' ALINA lander will use the 4G network to beam the first live HD video feed from the surface of the moon. The signal, which will operate in the 1,800-MHz frequency band, "will be broadcast to a global audience via a deep space link that interconnects with the PTScientists server in the Mission Control Centre in Berlin," according to the statement. "This important mission is supporting, among other things, the development of new space-grade technologies for future data networking, processing and storage, and will help advance the communications infrastructure required for academics, industry and educational institutions in conducting lunar research," Marcus Weldon, chief technology officer at Nokia and president of Bell Labs, said in the statement. "These aims have potentially wide-ranging implications for many stakeholders and humanity as a whole, and we look forward to working closely with Vodafone and the other partners in the coming months, prior to the launch in 2019." An illustration of PTScientists' Autonomous Landing and Navigation Module (ALINA) on the moon. In a statement, PTScientists CEO and founder Robert Böhme called the 4G network a "crucial first step for sustainable exploration of the solar system." By using a 4G network, PTScientists will be able to beam data from the Quattro rovers to the ALINA lander without depleting precious energy reserves or requiring the rovers to be stationary while transmitting data, the team explained in a mission description. "With Mission to the Moon, we will establish and test the first elements of a dedicated communications network on the moon," Böhme said in the statement. "The great thing about this LTE solution is that it saves so much power, and the less energy we use sending data, the more we have to do science!"